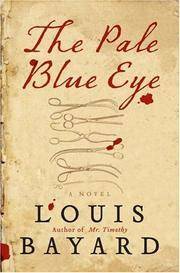 The Pale Blue Eye: A Novel. New York: HarperCollins, June 2006. Advance Reading Copy - 1st Edition, 1st Printing Glossy Pictorial Wraps AS NEW in WRAPS 8vo (6 x 9), 411 pp. Advance Paperbound Copy is FINE -- Unread, Unmarked and AS NEW in AS NEW glossy pictorial wraps. (dc) The author of the highly acclaimed Mr. Timothy followed with this novel of murder and revenge at West Point , with the investigation conducted by a retired New York City detective who recruits a young cadet named Edgar Allen Poe to help. In AS NEW gift quality condition -- collectible. The Murder of Lawrence of Arabia: A novel. New York: Thomas Crowell , 1979. First Edition, First Printing 1/4 cloth Near Fine in Near Fine DJ 8vo (6-1/4 x 9-1/4), 271 pp. Book is FINE -- unmarked and would be AS NEW but for pale small faint tan stains (Coffee? Tea?) on top of and upper front edge block. Glossy pictorial DJ is NEAR FINE and has mylar protective cover over nearly invisible creases on top front, slight bump on spine. (h) It was ruled an accident but the rumor/legend still persists that there was a black sedan that intentionally ran his motorcycle off the road. Why would someone murder the hero? The legend goes on that he was planning a return to the Arab world and get into it again, while the crown wanted stability there. Great, well-written and even plausible "what if" historical mystery . 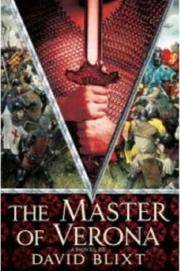 The Master of Verona (SIGNED). New York: St. Martin's Press, July 2007. First Edition, First Printing Glossy Pictorial Wraps AS NEW in AS NEW DJ 8vo (6-1/4 x 9-1/2), 569 pp. Hardbound book is FINE -- Unread, Unmarked (except for author's signature on title page and black dot on top page block) otherwise AS NEW in AS NEW glossy pictorial DJ. 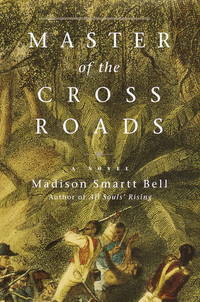 (h) A complex and fascinating novel of the poet Dante and his son on the road in 14th Century Verona. Publisher's Weekly called it "...rollicking historical debut from Shakespearean actor Blixt." and "...a novel of intricate plot, taut narrative, sharp period detail and beautifully realized characters." I know it's inappropriate given the period and location, but the words "wild and wooly" keep coming to mind. A brilliant novel that's also a lot of fun. Can't beat that. 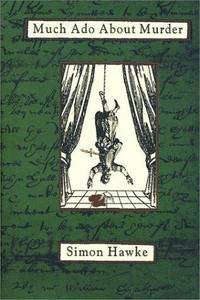 Much Ado About Murder (Shakespeare and Smythe Mysteries #3). New York: Forge Books, December 2002. First Edition, First Printing Hardcover Near Fine in Fine DJ 8vo (5-3/4 x 8-1/2), 237 pp. Book is FINE -- Unmarked (except for a single black dot on bottom page block), Unread, and Nearly AS NEW. DJ is AS NEW. (h) This is third in the series featuring Shakespeare (and Symington Smythe) as struggling theater group members. They are both out of work, and as is the custom in this series of books ("A Mystery of Errors" and "The Slaying of the Shrew") they seem to find themselves involved in solving a murder. Mr. Hawke is author of the "Wizard of Fourth Street" series. New York: Farrar Straus Giroux, 1999. First Edition, First Printing Hardcover AS NEW in WRAPS 8vo (6 x 9-1/4), 329 pp. Hardcover book is FINE -- Unread, Unmarked (except for the author's signature on the title page) and AS NEW in AS NEW pictorial dj. Gift quality condition. (h) Hansen's brilliant and fascinating previous novel -- The Chess Garden -- is a tough, perhaps an impossible act to follow. 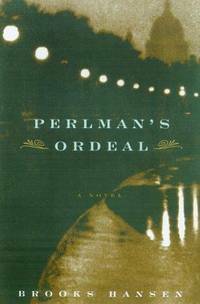 But in reading Perlman's Ordeal, about halfway through I remarked that "this is a book for the people who didn't understand how to appreciat e the fantasy of The Chess Garden." By the time I finished it, I realized not only was that true, but this story of a turn-of-the-century psychoanalyst using hypnosis as a tool, also was designed to teach that overly practical person HOW to enjoy a true fantasy. The love of myth and music pervade the book, and it is a delight, even if it does not have all the pyrotechnical and complex magic of previous book. Its purpose is different. While The Chess Garden's geographical range goes from Ohio to the Antipodes, this takes place, almost completely, in a small office in London where Dr. Perlman is discovering there's an enormous universe going on that he'd never seen. 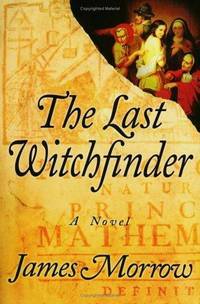 The Last Witchfinder: A Novel. New York: William Morrow, 2006. First Edition, First Printing Hardcover AS NEW in AS NEW DJ 8vo (6-1/4 x 9-1/4), 526 pp. Hardbound book is FINE -- First edition, first printing AS NEW in AS NEW pcitorial DJ. Small remainder mark on bottom page block. (h) From the always-surprising James Morrow (Towing Jehovah, Only Begotten Daughter, etc) this book concerns the hanging of witches in Restoration England and a young girl -- daughter of the hangman -- who sets out to demolish the Parliamentary Witchcraft Act using logic and driven by the horror of what she'd seen when a favorite aunt was wrongly accused and executed. New York: Marian Wood/ Putnam, 2005. First Edition, First Printing 1/4 cloth AS NEW in AS NEW DJ 8vo (6-1/4 x 9-1/4), 448 pp including Author's Notes describing which plot features were historically true. Book is Fine -- unread, umarked (except for remainder mark on the bottom) and AS NEW in AS NEW glossy pictorial DJ. 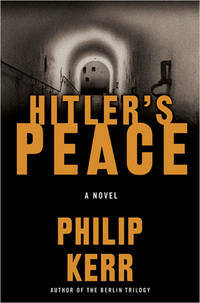 (h) Subterfuge and intrigue as the Teheran Conference in which Hitler palns to make a deal for peace is in the works, but so is Himmler's plan to assassinate the Big Three -- FDR, Stalin, and Churchill in a last minute attempt to salvage the war. Brilliantly written and surprisingly, much of the most bizarre and creatively impressive twists and turns were historical facts. Philip Kerr is one of my favorite writers and I would say this is one of his best except then I think about Esau and Berlin Noir (three detective novels) and The Shot and Five Year Plan and The Second Angel and all I can say is it's up to his amazingly high standard for insightful, even philosophic writing that is also a gripping page turner. New York: Marian Wood/ Putnam, 2005. First Edition, First Printing 1/4 cloth AS NEW in NEAR FINE DJ 8vo (6-1/4 x 9-1/4), 448 pp including Author's Notes describing which plot features were historically true. Book is AS NEW (except for remainder mark on the bottom) in NEAR FINE glossy pictorial DJ (some bumping on top and bottom of spine, 3 dimpling indentations on front near spine as if from something set down on book. No rips or tears or punctures. DJ now enclosed in Bro-Dart protective cover. (h) Subterfuge and intrigue as the Teheran Conference in which Hitler palns to make a deal for peace is in the works, but so is Himmler's plan to assassinate the Big Three -- FDR, Stalin, and Churchill in a last minute attempt to salvage the war. Brilliantly written and surprisingly, much of the most bizarre and creatively impressive twists and turns were historical facts. Philip Kerr is one of my favorite writers and I would say this is one of his best except then I think about Esau and Berlin Noir (three detective novels) and The Shot and Five Year Plan and The Second Angel and all I can say is it's up to his amazingly high standard for insightful, even philosophic writing that is also a gripping page turner. 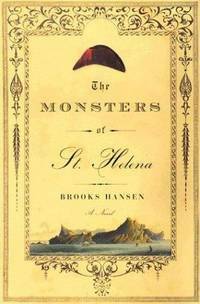 The Monsters of St. Helena. New York: Farrar, Straus and Giroux, 2002. First Edition, First Printing 1/4 cloth AS NEW in FINE DJ 8vo (6-1/4 x 9-1/4), 306 pp. Extraordinary novel is UNREAD and AS NEW in FINE/AS NEW DJ. (h) Remainder dot on top of pages, otherwise unmarked. An amazing account of Napoleon's exile to St Helena -- arriving there with a retinue of 1500 people, essentially doubling the island's population -- and at the center, a man regarded as a demon, who, after all, had laid waste to much of Europe and Russia. Magnificently researched by Mr Hansen with the history of the isalnd, the names of residents and retinue, and the brilliant imagination of the man who wrote "The Chess Garden," and "Boone." 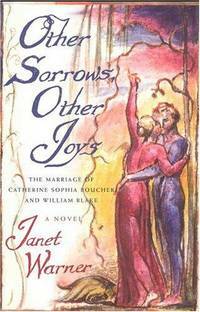 Other Sorrows, Other Joys: The Marriage of Catherine Sophia Boucher and William Blake -- A Novel. New York: St. Martin's Press, 2003. First Edition, First Printing Cloth AS NEW in AS NEW DJ 8vo (6-1/2 x 9-1/2), 371 pp including biographical notes. Book is UNREAD, FINE and AS NEW in AS NEW DJ. No marks, tears, rips, folds. (h) Well-researched, told by Blake's widow and set in a detailed dream of late 18th Century England, with views of Paris during the French Revolution. 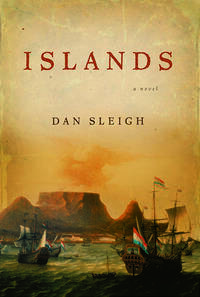 By Sleigh, Dan; translation from Afrikaans by Andre Brink. Orlando, FL: Harcourt, 2005. First American Edition Boards AS NEW in AS NEW DJ 8vo (6-1/2 x 9-1/4), 758 pp. Harbound First Edition is AS NEW in AS NEW pictorial DJ. (h) The premise is simple -- the first 50 years of the Dutch Settlement at the Cape of Good Hope in the late 17th and early 18th centuries. The story is woven fromthe life stories of seven men, all of whom are involved in one way or another with Pieternella, a beautiful young woman who is the daughter of the first mixed marriage in the colony. Painstakingly researched, and written in flowing narrative,, "Islands" seems to encapsulate the reality of a new land, new ideas, , new realities. Brilliant. 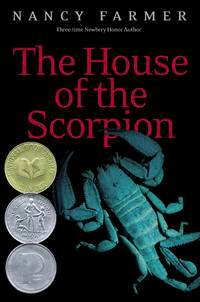 The House of the Scorpion. 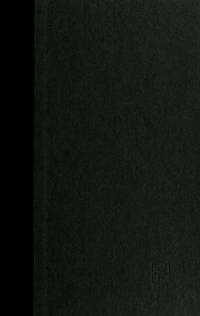 New York: Atheneum/Richard Jackson Books, 2002. First Edition, First Printing 1/4 cloth AS NEW in AS NEW DJ 8vo (6-1/4 x 9-1/4), 380 pp. UNREAD AS NEW book in pictorial AS NEW DJ. (h) Matteo is a clone ofEl Patron, gestated in a cow for 9 months and living in a country called Opium -- a strip of poppy fields between the U.S. and what once was called Mexico. Ursula K Leguin praised this book, saying (among other things) "It's a delight to read science fiction that gets the science right. New York: Pantheon, 2000. First Edition Hard Cover in green boards with gold type on spine AS NEW in AS NEW DJ 8vo (6-1/2 x 9-1/2), 732 pp includes Glossary, Chronology of Historical Events, Original Letters and Documents, and the almost-psychotically detailed and extensive French Classification of Races according to miniscule variations of color. This is Mr Bell's 2d volume (of a planned trilogy) on the Slave Rebellion in Haiti that began in 1794 with Toussaint L'Ouverture's uprising. The first volume -- All Souls' Rising -- was nominated for the National Book Award. The Summoning God: Book II of The Anazazi Mysteries. 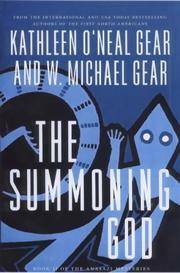 By Gear, Kathleen O'Neal and W. Michael. New York: Tom Doherty/TOR, July 2000. First Edition Glossy Pictorial Wraps Near Fine in Wraps 8vo (6 x 9-1/4), 366 pp including Bibiliography. Trade Paperback , NEAR FINE in NEAR FINE glossy pictorial wraps. SIGNED by both authors on title page. Remainder mark on bottom. The Gears are famous for their clear fine story-telling and their extensive diligent research on the subjects. This is the second book of the Anasazi Mysteries (continuing The Visitant) and takes place in the American Southwest in the year 1263.